Earl's Radiused Fuel Pump & Regulator Fittings are precision machined from aluminum, then anodized blue for great looks and durability. Each fitting are subject to a special machining process to smooth the inside area and radius the inlet on the O-ring port side to reduce turbulence and restriction in flow. 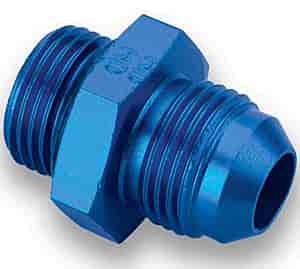 Earl's radiused fittings are ideal for use on fuel cells, pumps, filters, and regulators that accept AN port fittings.